"There's something fun for everyone in our million dollar midway with classics like Pop-A-Shot, Pac-Man, and Skee-Ball and tons of prizes to take home from the winners circle! Get into the action like never before at the sports bar that crushes the competition! Whether it’s college or professional, we take sports viewing to the next level. 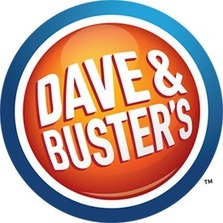 With exciting food and cocktails being added all the time, there’s always something new to try at Dave & Buster’s — the New Mix of FUN®!" Get our special Utah Kids Club 20.00 play card when you purchase a 20.00 play card. Just email customer service for your individualized special code and then print your 20.00 play card and GO!! info@utahkidsclub.com. *Please allow 24 hours for customer service to individualize your play card and email it back to you. Have FUN!